Brazing, welding, and soldering are the techniques used to join metal to metal. You principally employ brazing and soldering when you’re working in HVAC. You will need to know when to solder and when to braze. Brazing correctly means you’ll have a system that works right, standing up to extremes of pressure and temperature. If you do it wrong, joints will fail, as will the system they are designed to support. Brazing might be taught after the technician has learned welding or soldering, or in conjunction with them. Some of the same safety issues are involved in brazing as soldering, although the brazer will be working with significantly hotter temperatures. Brazers are also exposed to fumes, which are released when temperatures are too hot. Proper training and practice can help the brazer control the temperature to ensure safe working conditions. Here’s the difference between soldering, brazing, and welding. Soldering — Join two metals by melting a third filler metal between them, without melting the two metals. Brazing — Same as soldering, but the filler metal melts above 840 degrees F, so is much hotter than soldering. High temperatures create a stronger bond. Welding — Two metals joined by melting them together, but involves even hotter temperatures than the above two methods. Welded joints are the strongest. Welds offer the strongest bond but are not needed in the copper lines used in HVAC, a brazed joint being considered strong enough. Sometimes even a soldered joint is enough. There are some situations when brazing may be too hot, so the technician will have to exercise care and judgment and perhaps use soldering instead. Sometimes, when joining copper tubing to an air conditioner unit, you have to be careful so as not to damage rubber or nylon bushings with the hotter temperatures. The main reason a brazed joint is often preferred in HVAC work is that it’s virtually leak-proof. Most brazers use an oxygen-acetylene torch for brazing, as it gets hotter than the types of torches used for soldering. A turbo torch may also work. Brazing rods, similar in appearance to straightened metal coat hangers, are stronger, the more silver they have in them. To join copper lines in HVAC work, a technician will usually use brazing rods made of a copper-phosphorous combination. Lines must be heated until they are glowing red, so the technician has to keep the torch moving or a hole can be burned through the copper tubing. Brazing can be taught in a classroom, but beginners need practice and professional instruction to become proficient. Beginning students must contend with flammable items, difficult access, and awkward positions. Degree of heating, cleaning tubing, and parts to be used. How to heat evenly, moving flame in figure 8. Waiting for flame to turn green. Applying brazing rod (avoiding melting with torch). Experienced instructors can help student brazers improve results when working in the HVAC industry. For instance, students might learn that joints must be carefully heated so that parts aren’t damaged, and that damaged parts should be wrapped in wet rags to protect them. They might also learn that the proper level of nitrogen pushing through a refrigeration or air conditioning system will reduce copper oxidation, and compressor failure rates. Proper brazing techniques can be taught in the classroom or in the field. Also helpful: advanced A/C, boilers, basic electricity, and air and water balancing. A course in brazing should also teach proper safety procedures, and what sort of protective and safety equipment is needed, including clothing and gloves, and goggles or face masks. 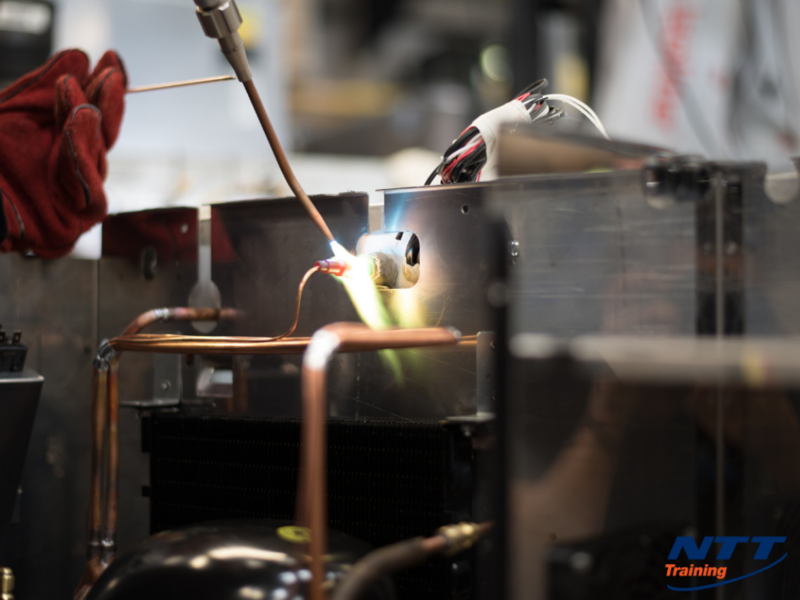 Help your employees improve their brazing techniques and the outcomes of their work with HVAC equipment with a three-day hands-on seminar on HVAC: Brazing (Advanced). Learn more from NTT Training.